After months of fundraising and preparation the time has come to travel to the West coast of Africa, more specifically, the Smiling Coast of Africa – The Gambia. How I wish the technology in Star Trek was available today; I could transport directly. Instead, I take the bus from Ottawa and arrive two and a half hours later in Montreal. Then, a 7 hour flight from Montreal to Casablanca. I arrive in Casablanca at around 11 am. I have to wait almost 11 hours for my flight. Luckily, the airline (Royal Air Maroc) provides me with free transportation and lodging in a hotel in downtown Casablanca. Even my meals are covered. After a decent lunch at the hotel restaurant, I go for a short nap, then shower and head off to explore the city. Casablanca is not a pedestrian friendly place. I follow the example of the locals and find my way across the crowded streets. There is plenty of honking and the exhaust fumes permeate the air. How I wish I could snap away with my DSLR but I don’t want to draw any attention to myself. I need to use the map on my smartphone – I am cautious when I take it out. The highlight of my day is wondering through the seemingly never ending market. Vendors selling fruits, vegetables and meats. The paths are narrow and crowded with goods and people. The rubble of of a building spills out onto the path. There are stray dogs and cats almost every 20 metres. Someone has poured milk in a blue plastic bag for several week old cats. There are old umbrellas and tarps to shade us from the sun. I finally arrive at the mosque and have very little time to waste. It’s time to walk back and grab my ride back to the hotel. Another waiting game at the airport and off I go for a hour flight this time. I arrive in Guinea Bissau and wait there for over minutes before we take off again. A short 25 minute flight and I finally land in the Gambia. Finally!! It is late, 2:45 am. Once in the airport, I have to fill out a form and wait in line for passport control. As I wait, I catch a glimpse of the guys and wave. I can see Spider waving back with both arms. After a few questions from the policeman at passport control I cross over and am warmly greeted by all three guys on the team; Pa Modou, Spidder and Yankuba. I can’t believe that all three are there. Not only that, there more NSGA people there to greet me including the director. I thank them profusely as we drive away from the airport. We arrived at Stew Scott’s place. Just an incredible guy that has been so supportive of Love4Gambia. Not only that, but he offered that I stay at his place while I’m in Banjul. Sweet. We say good night to the guys and I settle in at Stew’s place. I am immediately taken by the sound of the waves as the ocean is just steps away. 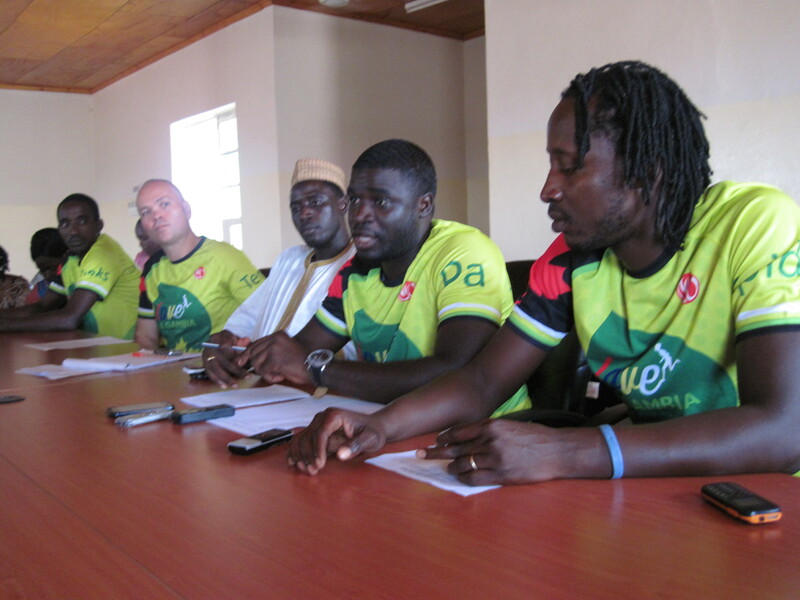 Over the next few days, I spend time with the guys and visit the NSGA office in the Gambia. I am so impressed by everyone there. They welcome me with open arms. I tell them how impressed by all the work they do from my discussions with them. On Friday June 6, it’s time for the press conference. I am nervous – just a tad. As I wait I talk with Yankuba and other members of the NSGA. Kebba arrives with Cathy and I so pleased to meet them both. Just before entering the conference, I ask Cathy to take photos. The official start time of the press conference? 9 am. We finally start: just before 11 am. The press conference goes extremely well. The message of Love4Gambia and the mission of the Nova Scotia Gambia Association is well communicated by all and the media seems to show great interest. One of the journalists there was a peer health educator with the NSGA and he is keen to share our story. Just after 9 am today (June 7) we depart for Basse. This will be our home base for the next 3 nights. The drive is equivalent in distance to a drive from Ottawa to Quebec City but it takes us much longer. The roads are paved and I must say much nicer that a lot of our pothole filled roads in Canada. We have several stops to make along the way. We notice the heat intensify as we continue eastward. Even the Gambians are finding hot! We arrive shortly after 4 in Basse and I am settled in a nice house in an orphanage compound. Tomorrow is the big day!! Day one of the 424 kilometre run! Tomorrow at 6 am, we will be driving to Koina – a 1 hour drive. From that point on, I will be running back westward, 25 kilometres per day to Banjul. Hopefully the sun won’t be out in full force and there will be slight breeze. A guy can hope. One last thing: I can’t say enough about Pa Modou, Spider and Kebba. What an incredible team!! More about them in future posts. Best of luck as you start your journey tomorrow! Go team Love4Gambia! Bonne course demain Terry. Oublie pas ta crème solaire!! All the best for your first day of running!! Thanks for sharing your adventure on line…. Enjoy The Gambia and the amazing people there! Can’t wait to hear how your first day goes. I’m glad to hear everything is going well Terry!! All the best in your amazing adventure in the Gambia! We’ll be following your progress!